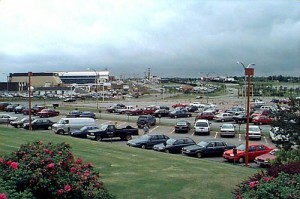 Halifax’s Stanfield International Airport (YHZ) is Nova Scotia’s main airport and one of Canada’s busiest. You’re certain to arrive here if you’re flying to Nova Scotia from elsewhere in North America or overseas. There are plenty of nearby hotels and inns if you need to stay near this base for air travel across Nova Scotia and the Maritime provinces. The airport is served by a range of scheduled and charter airlines. If you’re planning to fly to New Brunswick, Prince Edward Island or Newfoundland, you may well change planes in Halifax. Despite its importance as a regional transport hub, you’re unlikely to use the airport for a flight elsewhere in the province. Most people travel by car because distances are relatively short, not to mention the generally high cost of internal flights. If time is short and your budget is healthy, you might fly from Halifax to Sydney (YQY), at the province’s northern tip. When you arrive, you’ll be about 35km from downtown Halifax. You can stay nearby for a night if you arrive late at night or get over some jetlag but once you’re ready for sightseeing, you’ll want to head into the city. There are many ways to get into Halifax and to points across Nova Scotia. Airporter provides a 24-hour shuttle service between the airport and a number of major hotels in Halifax for $19 per adult. It stops regularly at the: Westin Nova Scotia, Lord Nelson, Holiday Inn Select, Citadel Halifax, Delta Halifax, Marriot Harbour Front, Holiday Inn Harbourview, Courtyard Marriot, Four Points, Prince George and the Delta Barrington. Other shuttle buses go from the airport to destinations across the province. Acadian (also known as SMT) has a service between the airport and province-wide destinations. Expect to pay about $55 for a taxi service into Halifax city centre. There are always taxis waiting directly outside the airport terminal for customers. If you’re arriving by plane and want to travel a lot around the province, renting a car gives you ultimate flexibility to choose when and where you travel. There are several international rental agencies in the domestic arrivals hall of the airport.